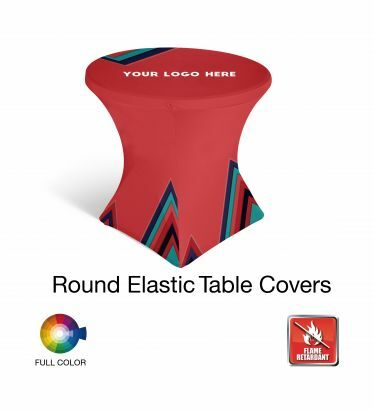 Our Round Classic Custom Stretch Table Covers from Tuff Flags offer a luxurious upscale design that can enhance the look of your trade show display and earn easy attention from your audience. 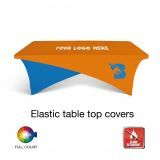 Made of Stretch Polyester Fabric, our table covers ensure a perfect fitted look and a sleek appearance. 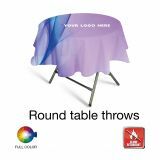 Our dye sublimated table covers are machine and hand washable, wrinkle resistant and waterproof. 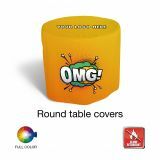 Offered in a heavy plastic pouch with zipper to store, our table covers will make a long lasting impression among your audience at easy rates. Extremely Fast Delivery!! Usually within a week to a week and a half. 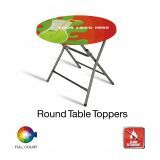 Certified Flame Retardant to meet Convention hall requirements. 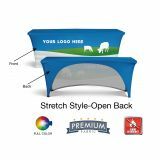 Free Artwork and Setup within 24 hours.